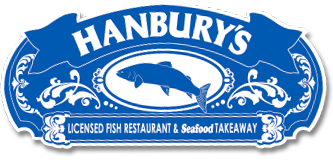 Hanbury’s Famous Fish and Chips of Babbacombe have been serving fantastic fish and chips for over three decades. Hanburys Takeaway now has a licence to sell alcohol. As well as offering Hanburys Amber Ale (made to our own recipe) we have a selection of Beers, Lagers and Wines to enjoy with our Takeaway fabulous fish and chips. Well-loved locally, people will travel several miles for a plate of Hanbury’s fish and chips. Holidaymakers also come back year on year to relish the Hanbury’s experience. The takeaway next door is a stone’s throw from the beautiful Babbacombe Downs where you can sit on a bench and eat your fish and chips looking out across the spectacular Lyme Bay. What could be nicer? Eating in the cosy, welcoming restaurant is a great choice for an evening out or a special celebration. The restaurant is decorated with delightful pictures by local artist Liz Jones and dotted with various items of interest. The vibrant blues, chalky whites and smooth greys have been expertly chosen to create a light and breezy seaside feel which will enhance your dining experience. The takeaway next door is a stone’s throw from the beautiful Babbacombe Downs where you can sit on a bench and eat your fish and chips while looking out across the spectacular Lyme Bay. What could be nicer? Sustainability is a key issue that Hanbury’s work hard to promote and are fully committed to ensuring that the fish we source comes from sustainably managed stocks and is caught or farmed in a way that causes minimal damage to the marine environment and other wildlife. We work alongside the Marine Conservation Society and the Marine Stwerdship Council to keep our knowledge up to date and to provide our customers with enough information to make informed decisions about the fish they eat.